Elisabeth “Lis” Handgraaf earned her degree in athletic training then worked as a trainer for local schools. But while Lis enjoyed the work, she always felt she could be doing more. Lis decided to join the fire department, then she breezed through EMT school and got her Paramedic license at Lakeshore Technical College. Before long, she was promoted to lieutenant on the fire department, and she began working in EMS full-time. Lis was promoted again on the fire department, this time to captain, and shortly after that to EMS director. In 2016 Lis joined Bell Ambulance and earned her Critical Care through UMBC. She now routinely does Critical Care ground transfers and also works in the 911 system in Southeast Wisconsin. She was promoted to Field Training Officer quickly, and has taken on numerous projects, including protocol rewrites, oversight of multiple patient simulation trainings, and development of a new driver training course. 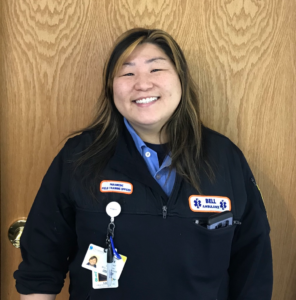 In 2017 Lis was voted the Bell Ambulance Employee of the Year by her peers. Lis never shies away from the opportunity to teach and often falls back on her years of athletic training to explain cases of trauma, skeletal-muscular injuries, and head and spinal injuries. Lis and her husband Richard live in Fox Point, Wisconsin, and are the proud parents of Dottie, their rascally blue-tick coonhound.